There are many benefits your customer can gain by moving his voice or total communications to the cloud. For example, both Hosted VoIP and UCaaS will get your customer out of the time-consuming business of buying, maintaining, and updating his own hardware and software systems. But how can you spot a Hosted VoIP or UCaaS opportunity? Start by asking your customer these 8 questions to uncover their basic communication needs, assess the communications systems they are currently utilizing, and map out their long-term objectives. Their answers will clue you in on whether Hosted VoIP or a fully integrated communications system (UCaaS) is the right move for them. Then, give us a call so we can explore the best cloud-based communication solutions available. 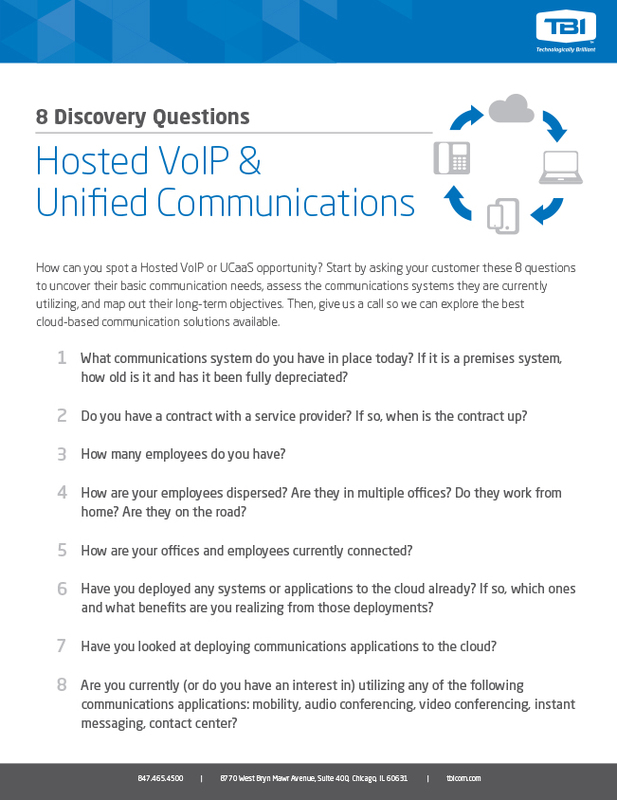 Download "8 Discovery Questions for Hosted VoIP & UCaaS Opportunities".